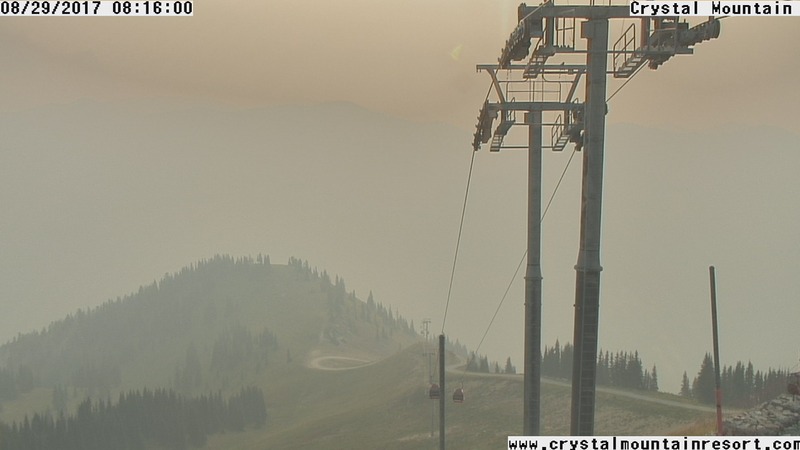 Smoke has returned in a big way over Washington State. 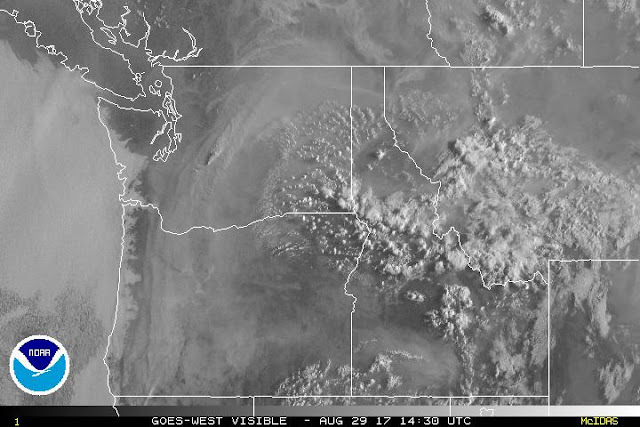 Yesterday's (Monday) MODIS satellite image showed large amounts of smoke moving northward from large fires in SW Oregon and NW California and local fires over the eastern slopes of the Cascades are making things worse. The visible satellite image this morning at 7:30 AM really shows the plume of smoke, which is worse south and east of Seattle. 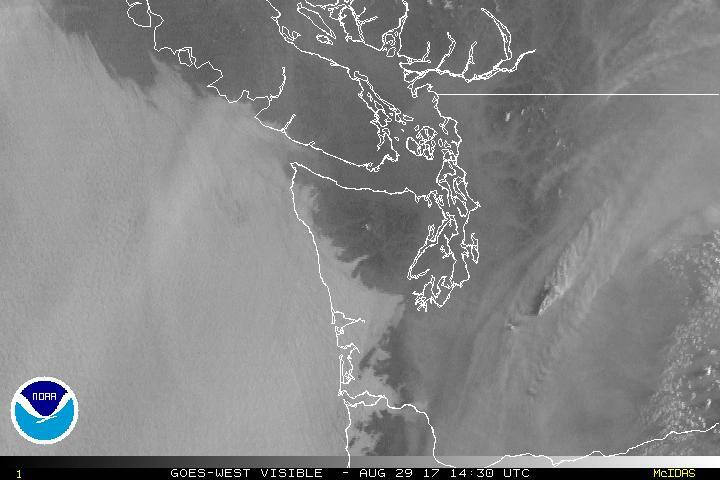 (Low clouds are along the coast). A close up view really highlights a plume of smoke emanating form a fire over the central Cascades, which is topped by a pyrocumulus cloud that is clearly casting a shadow. 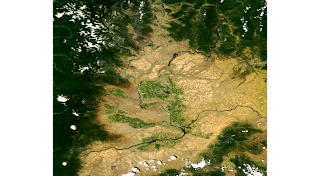 The latest MODIS satellite photo shows the impressive nature of two Washington State fires. Wow. And the denser smoke to the east of Seattle was evident in this sunrise shot looking towards the Cascades from the Space Needle panocam. The smoke unfortunately has mixed down to lower levels over western WA and the air quality has declined substantially in Seattle (see graphic from Puget Sound Clean Air Agency). The regional air quality situation is scary (green good, red bad, purple means you better not breathe). Much of western Oregon has very poor air quality. On the positive side, the smoke is reducing temperatures, as shown by this plot of solar radiation at the UW. Yesterday, the solar radiation was reduced by roughly 13%. Did you notice the strange yellow/reddish cast to the light? 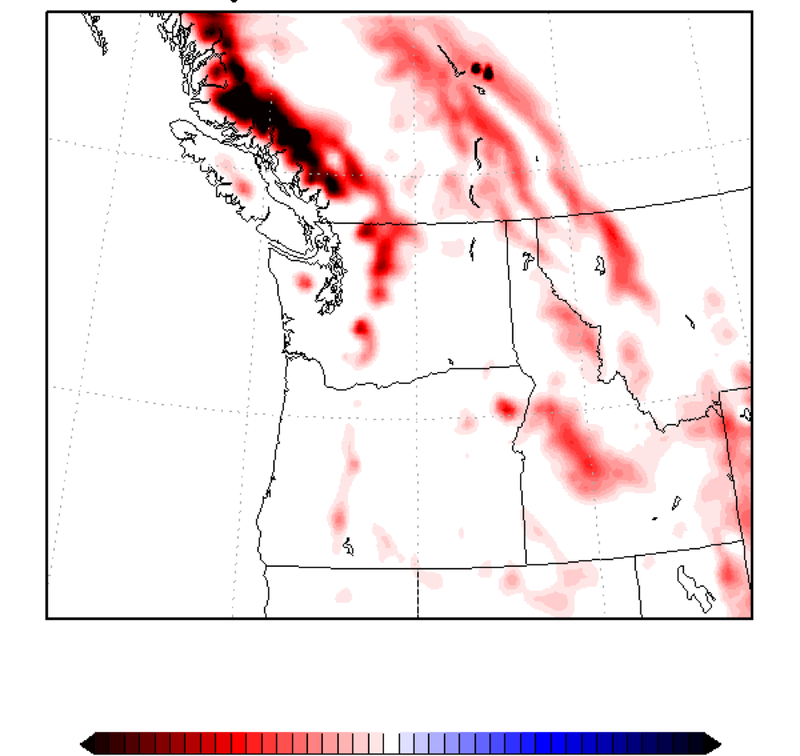 The latest Canadian smoke model forecast suggests that increasing onshore flow tomorrow should blow a lot of the smoke eastward, improving conditions over Western WA. Tomorrow (Wed) there will be a mini-marine push of cool, ocean air as an upper-level trough comes through (see map). But this will bring only temporary relief as ANOTHER ridge of high pressure moves in (see forecast for Friday). How Will Human-Forced Climate Change Affect the Pacific Northwest? It is an issue of extreme interest to almost everyone: how will human-forced climate change affect our region? This blog will review what I believe is the state-of-the-science, one that will avoid hype or politicization of the issue. 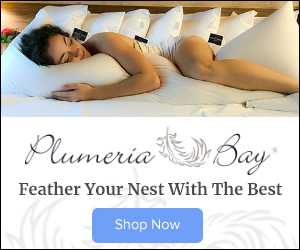 One based on peer-reviewed publications and the best models we have available. And an analysis that will be honest about what we don't know and the uncertainties. 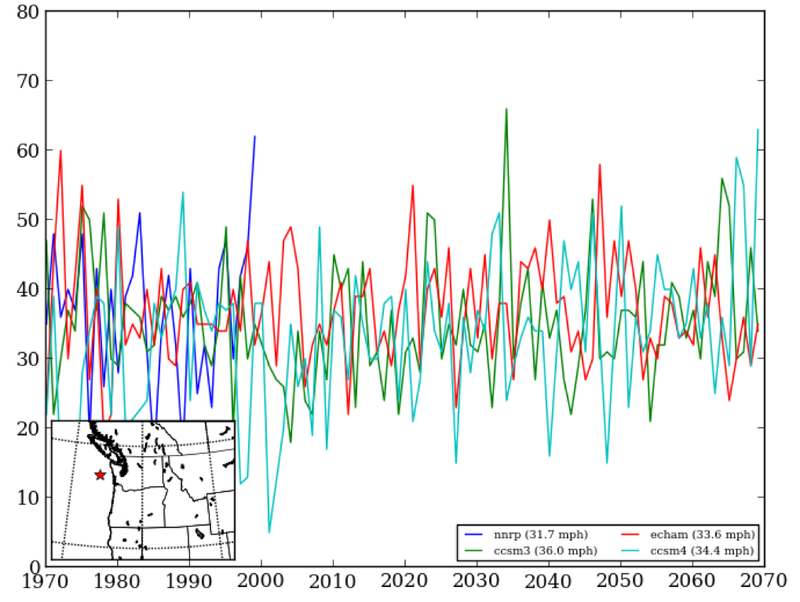 What Climate Changes Have Occurred During the Past Decades in the Pacific Northwest? Mankind has already changed the surface climate in our region in profound ways. 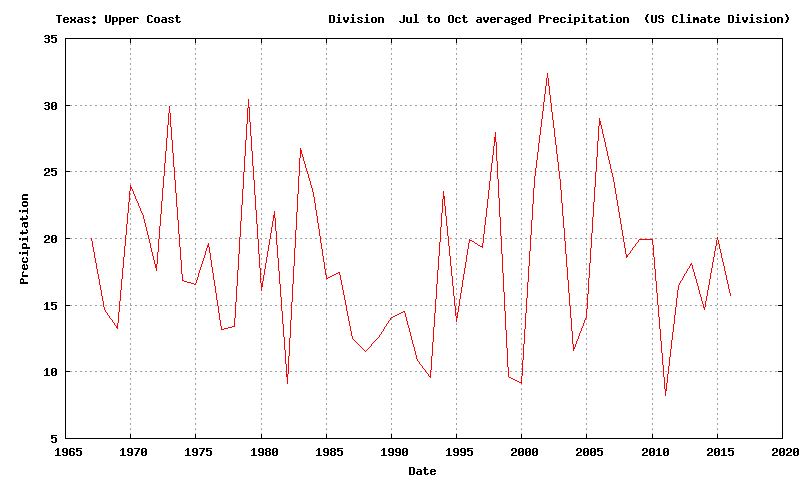 We have massively irrigated parts of eastern Washington, reducing summer temperatures there (2-5F). A high resolution satellite image illustrates the vast irrigated areas in the Columbia Basin. 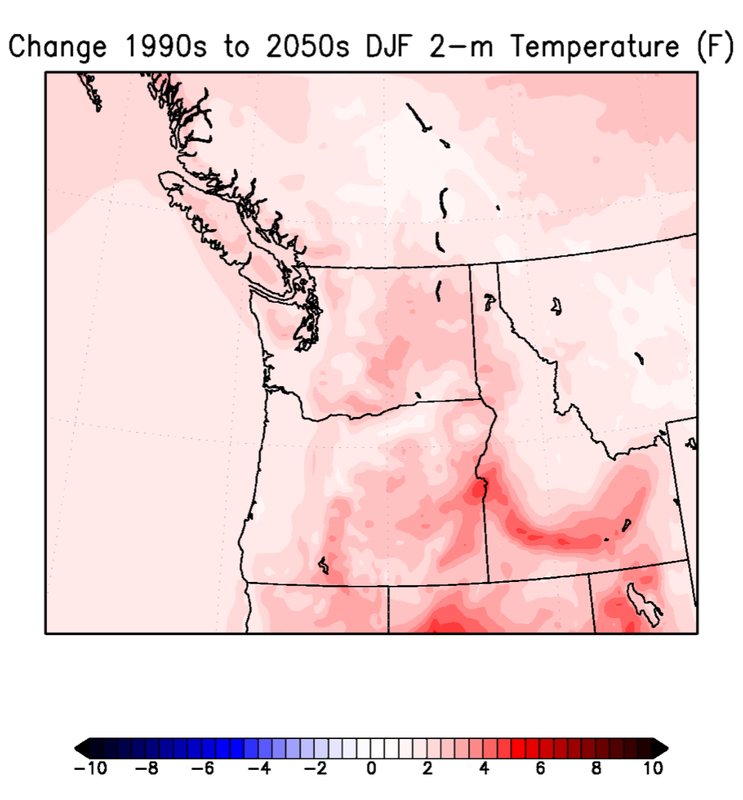 We have cut down the trees in western Washington, replacing them with concrete and buildings, substantially warming the surface (as much as 5-10F, see satellite based temperatures below). 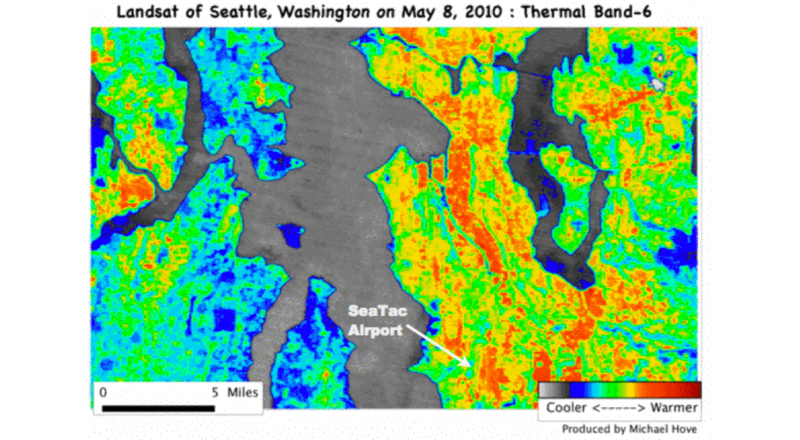 Thus, there are urban heat islands in our built up area, with enhanced local temperatures. We have created large farms in eastern WA, tearing off the protective surface vegetation, resulting in dust storms. 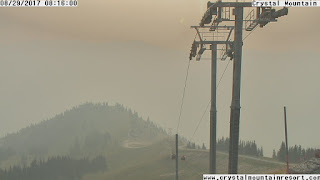 And our mismanagement of eastern Washington forests have resulted in increasing large fires and major smoke outbreaks. 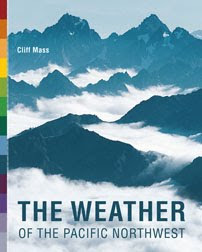 There is more, but the message is clear: human activities have profoundly changed our surface climate in limited areas, without even talking about greenhouse gases in the atmosphere. 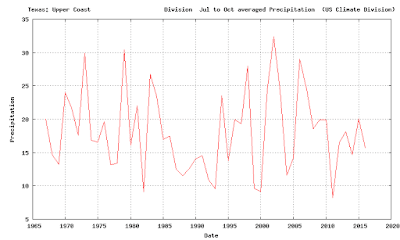 What do surface weather observations show, regarding changes in temperature and precipitation over our region during the past decades? Is there a trend? Here are plots of NOAA/NWS average temperatures over Washington State for January through June for the past 50 years from their climate division data set (I chose a half year so 2017 could be available). For temperature, there was a big spike in 2015 and a secondary one in 1994, but the overall trend is small, with perhaps a degree of warming for the entire period and little trend since the late 1970s . 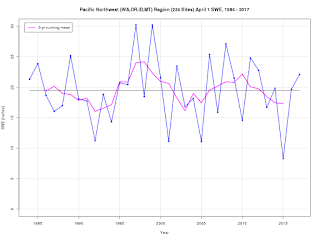 Most of the increase occurred abruptly in the late 1970s, associated with shift in the Pacific Decadal Oscillation (PDO), which is a mode of natural variability. And there was some impact of urbanization. 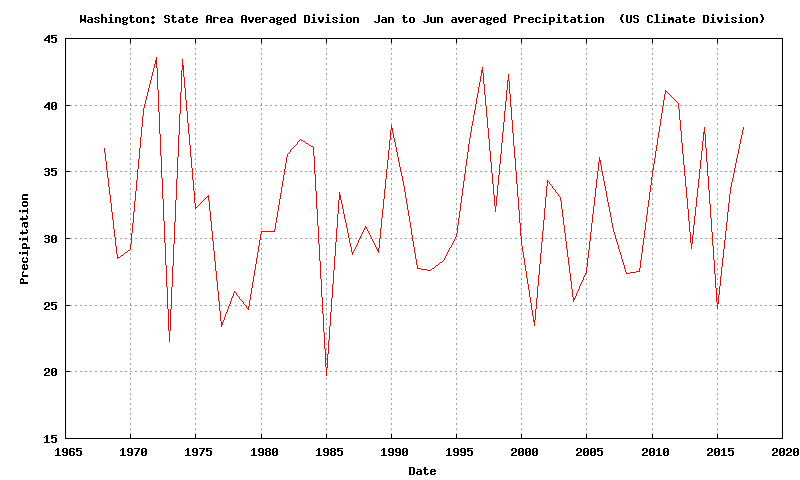 Precipitation over the State shows little trend, with lots of transient up and downs. 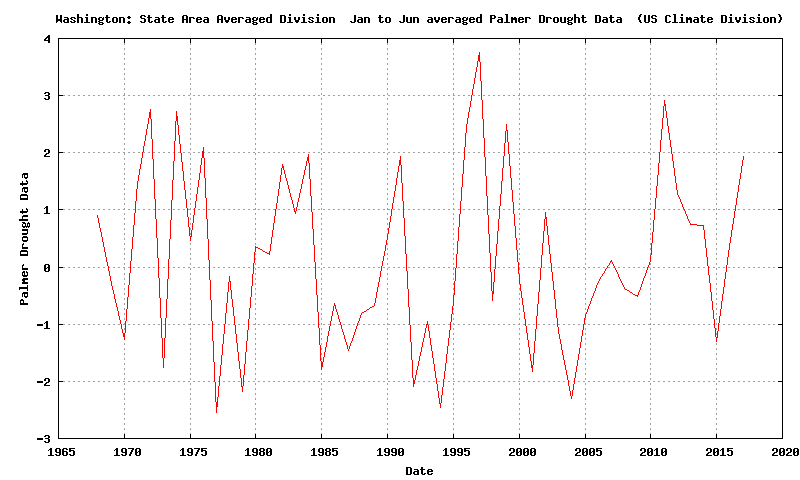 And a plot of the Palmer Drought Index (which includes precipitation and temperature) shows little change. Regional snow pack on April 1 (right before the big spring melting season) has shown little trend during the past 40 years. 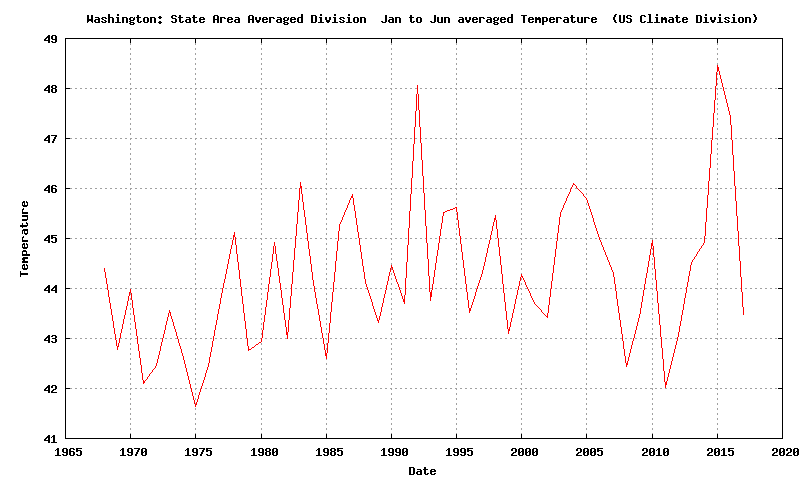 The bottom line is that there has been little change in our regional climate over the past half century. This is in contrast to other regions (like the Arctic and continental interiors). 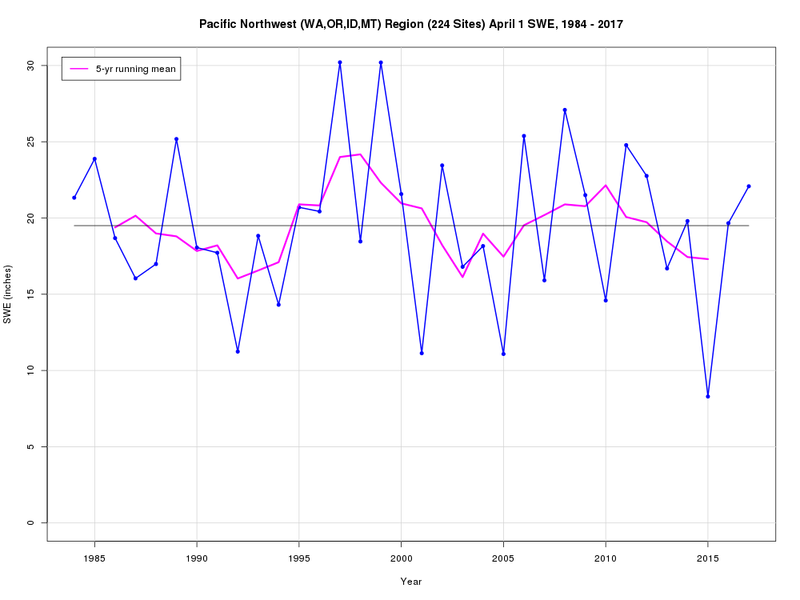 One reason for our static situation is the vast Pacific Ocean, which has not warmed up much during the past 50+ years. This graphic of surface temperature changes over the past 70 years illustrates this. But what about the future? 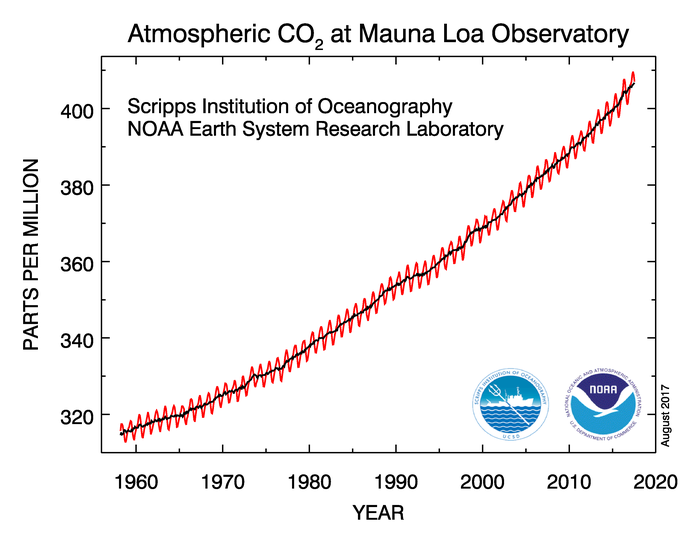 There has been an increasingly rapid upward trend in greenhouse gases (CO2, methane, water vapor), with human-caused increases in CO2 being the dominant forcing agent. The science is clear: increasing greenhouse gases will warm the planet--but there are a lot of nuances and details that are critical. Mankind has done little to stop the increase in CO2, with a fast upward trend in renewable energy being overwhelmed by surging use of coal, oil, and natural gas (see plot of CO2). Carbon-free nuclear energy is being rejected. 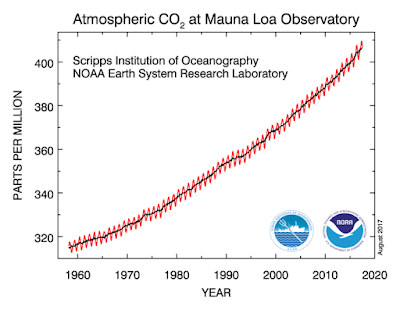 CO2 concentrations are actually rising more quickly today than decades earlier. The Arctic warms up more than anyplace else (due to melting polar snow/ice and some subtle radiative effects). 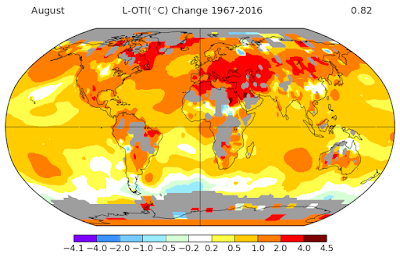 The continents warm up more than the oceans (the oceans have huge thermal mass that take time to warm), and the eastern oceans typically warm up more slowly than western oceans. The Northwest, downstream of an eastern Ocean, thus will warm up more slowly than most. 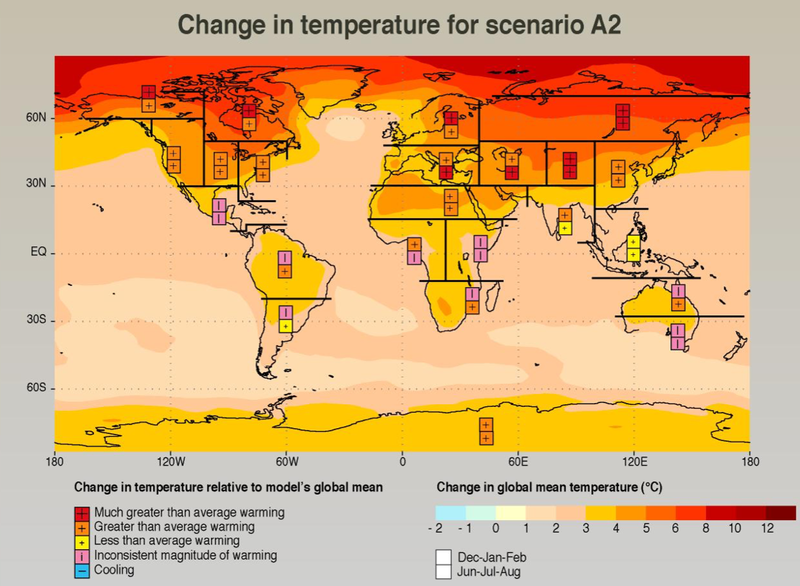 Although the global climate models are our most powerful tools for looking forward, they are major issues. First, we have to assume how much CO2 and other gases will be in the atmosphere later in the century. Second, they lack the resolution to get our local climate correct. 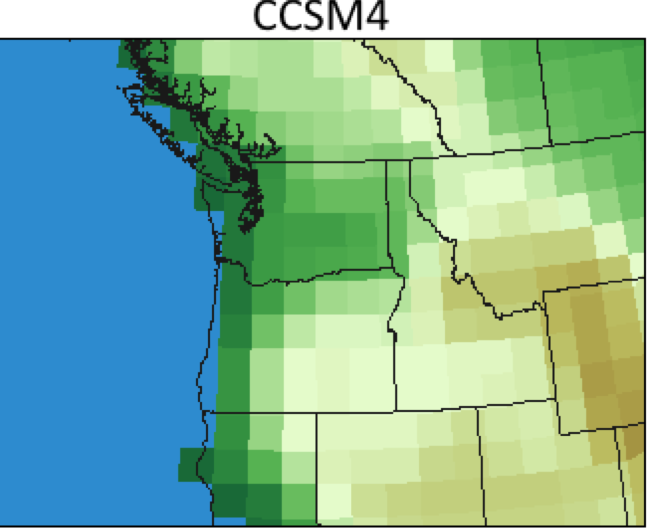 As shown below (the terrain from the NCAR climate model, CCSM4), the current generation of global models don't have the Cascades, Olympics and other critical geographical features that dominate our local climate. Third, the climate models have major disagreements in regional areas. In a classic paper, Deser et al., 2012 (Nature Climate Change) ran an ensemble of 40 climate simulations, starting each slightly differently to simulate trends through 2060. The results for the temperatures at Seattle (see below) varied greatly, with a few runs showing no warming and others much more. 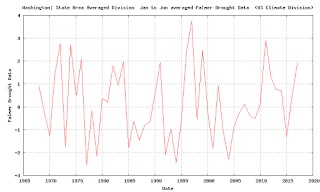 Fourth, many of the global climate models have serious flaws. Some can not realistically duplicate the current climate (e.g., double Intertropical Convergence Zones, serious biases, severe problems with organized tropical convection). And some climate scientists believe that the "tuning" to match the 20th century climate makes them overly sensitive to increasing CO2. 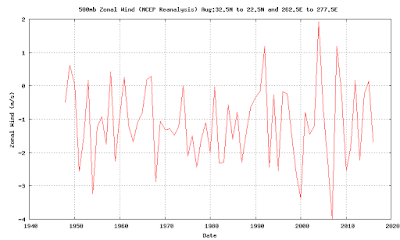 There is a lot of dirty laundry in the climate modeling business that the general media and others are not aware of. 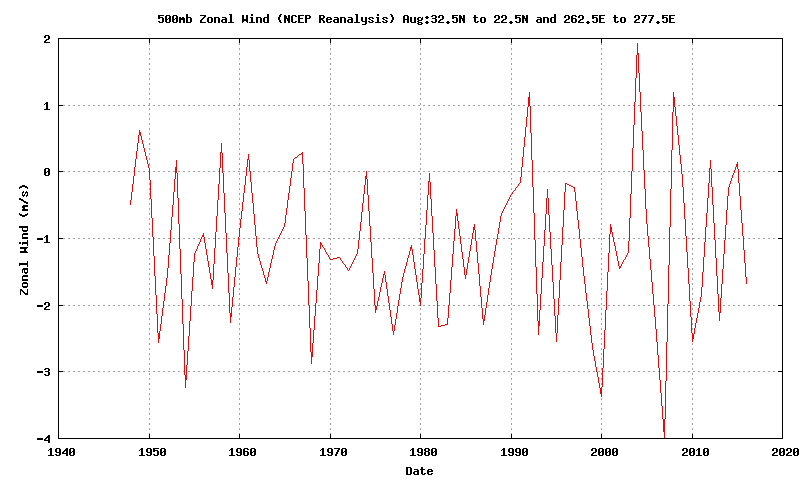 Our current generation of forecast models can not predict seasonal changes with any skill...this is a major warning. So what do we do? The roughly 2-dozen global models are the best tools we have. Society desperately needs guidance regarding the local impacts of climate change driven by increasing greenhouse gases. So why not start with the best ones (the ones that match contemporary climate the best) and see what changes they have in common. And we can use the best models to figure out the local impacts by running high-resolution regional climate models that are embedded and nested in the global models. 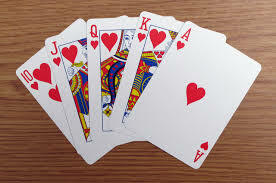 And when we do this, we have to be totally honest about uncertainties and limitations. 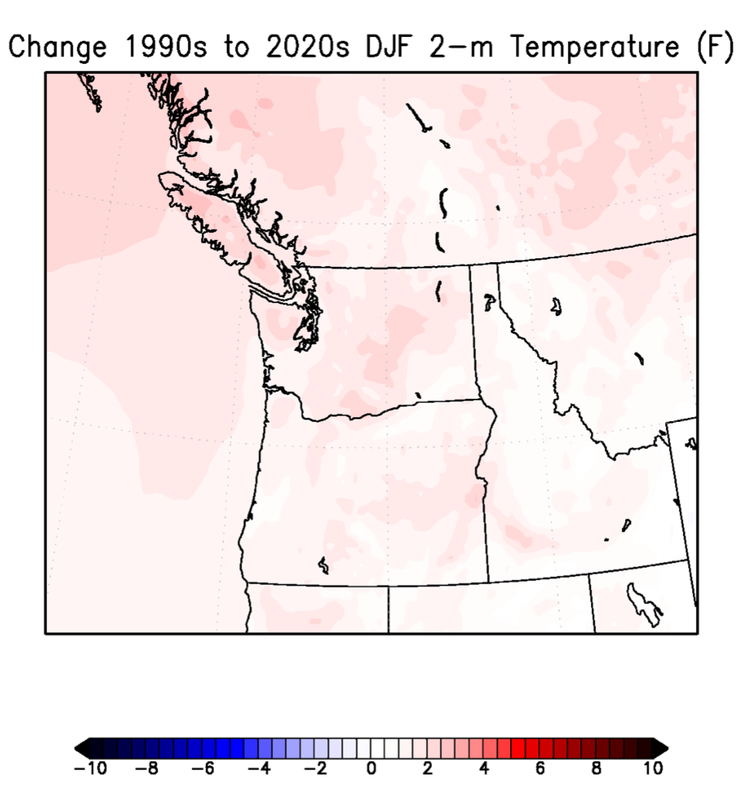 Let me show an example of such a regional climate model simulation for this century for the Pacific Northwest. And be prepared to be shocked. 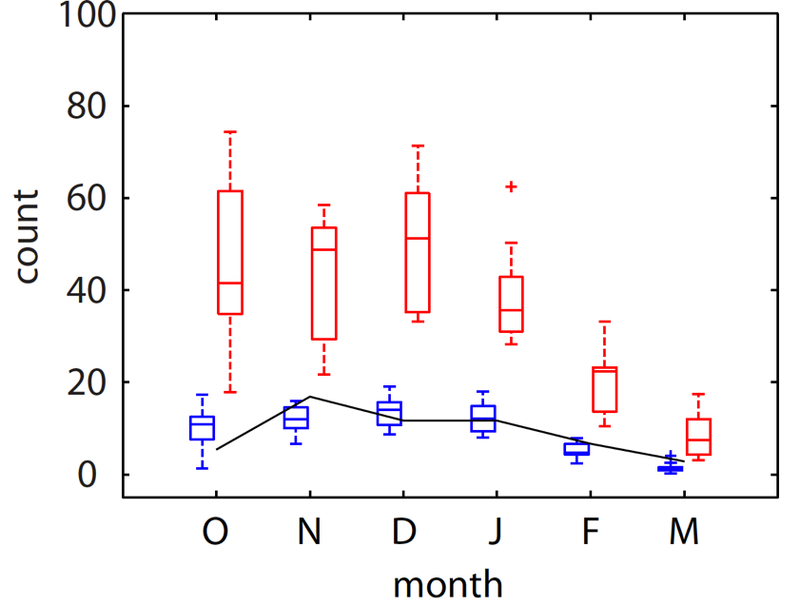 Let's start with surface temperature (2-m temperature) for winter (DJF) assuming mankind keeps on its current track of greenhouse gas increases (a pretty good bet at this point) The change between the 1990s and 2020s is small, with all warming, but not many locations doing so by more than 3F. Between 1990s and 2050s? More warming, with bands of greater increases. 2090s? Yikes...a different world, with some places warmer by 6-8F. Why the bands of greater warming? That is where we are losing snow at lower elevations. 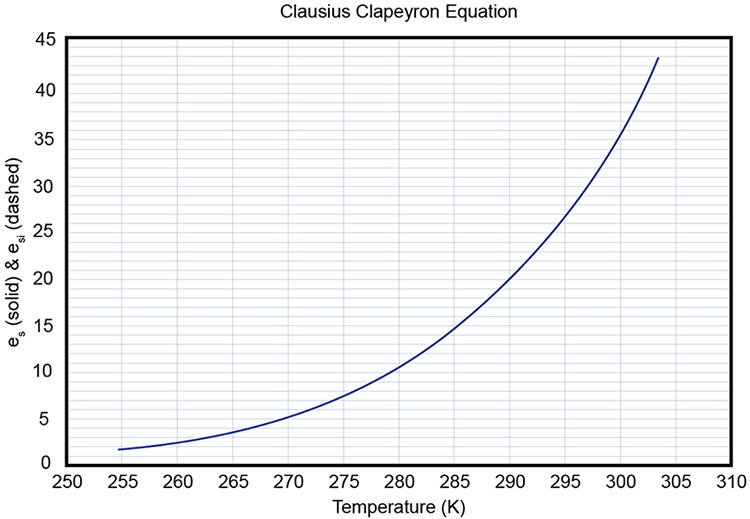 Snow reflects solar radiation, so a loss of snow really revs up the heating. You need a high-resolution model to see this effect. 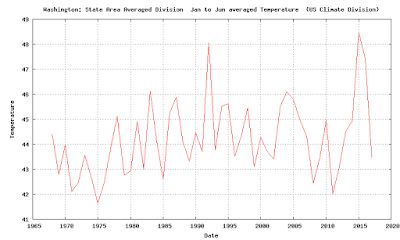 A key issue is that warming is not uniform in time. The warming is slow at first (aided by the slow to warm Pacific), but by the end of the century it really revs up. 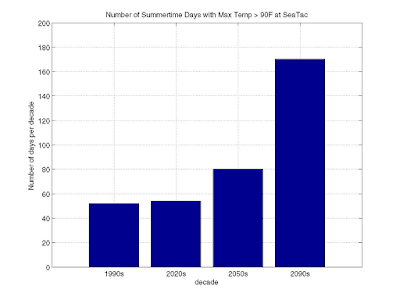 Another way to see this is a plot of the number of days per decade above 90F at Sea Tac Airport. Not much change in the 2020s, up a bit in 2050, and BIG increases during the late 2090s. For all of you under 40, you should make a note to yourself to buy an air conditioner in 2050. Maybe two. 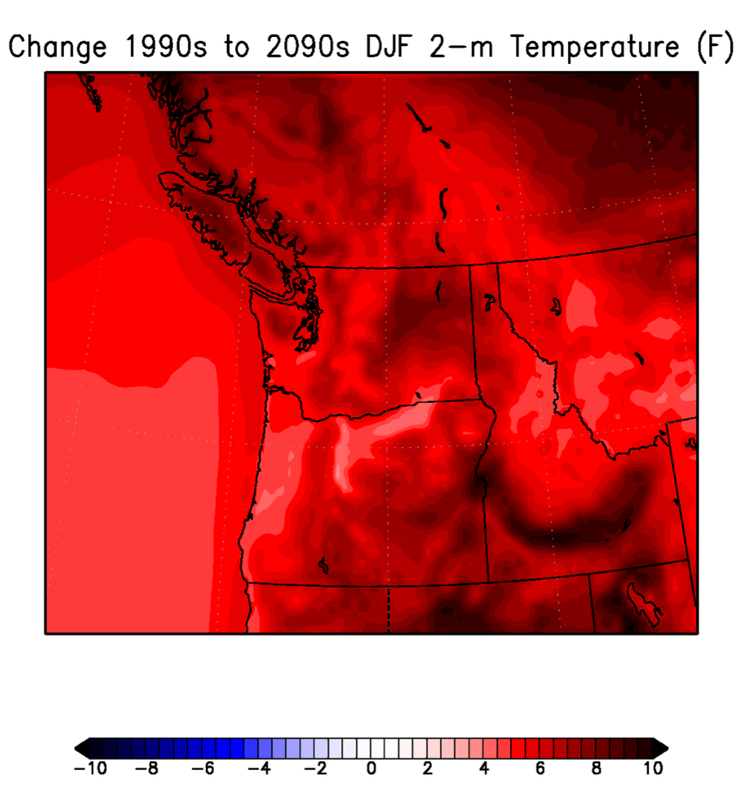 I can't stress this enough.... the big changes due to human-caused global warming in the Northwest are AHEAD of us. The current NW climate has been relatively unchanged so far. But saying this has gotten me in total trouble with some local climate advocates, who call me all kinds of names for talking about this "inconvenient truth." I mean really nasty stuff, like being a "denier", a "contrarian", "dangerous", "losing my mind", and lately being sympathetic to "white supremacists". You deserve the truth, not manipulation, and exaggeration to ensure "you do the right thing". 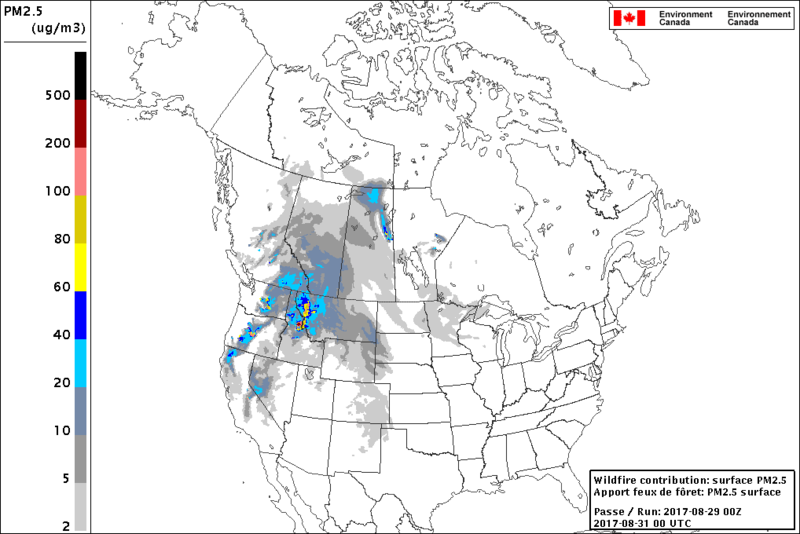 What about precipitation in our region? 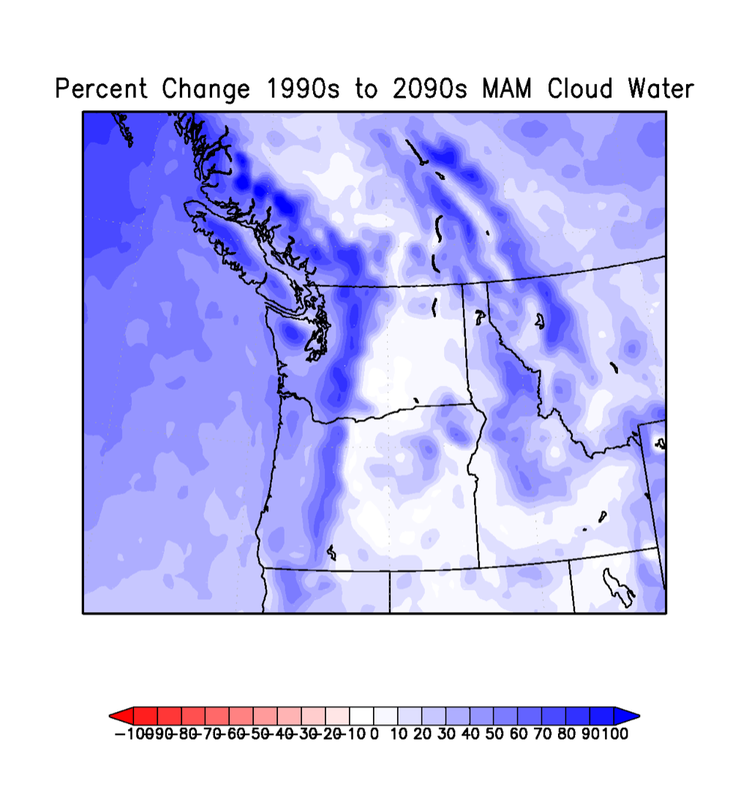 Most simulations, either based on global climate models or their regional "downscaled" versions indicate that there will be a small increase (5-10%) in regional precipitation (changes over Puget Sound are shown below). We will retain our water as the earth warms. This makes sense, a warmer atmosphere can "hold" more water, so our precipitation will be juiced up. But occasionally, it may be juiced up more than we like. The latest simulations suggest that atmospheric rivers---plumes of water vapor coming out of the tropics/subtropics--will get substantially enhanced by global warming, and our extreme precipitation events during such rivers could be 30-40% stronger by the end of the century. 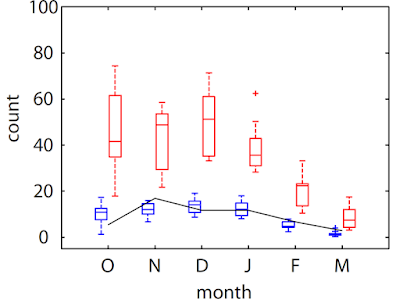 The number of heavy precipitation events will increase dramatically, particularly during the fall (see graphic below showing changes in the number of event between the ends of the 20th and 21st century). 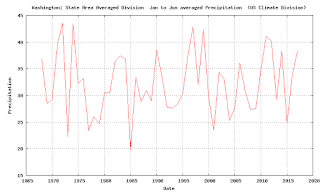 With a big increase in heavy precipitation events, flooding on our major rivers will increase. We will need to deal with this, pulling folks away from such waterways. And yes, not allowing people form living on or near slopes where slope failures could endanger them (e.g., Oso). As our region warms, the snow level will rise in the mountains, with much more precipitation falling as rain in the middle elevations, where previously there had been snow. We will have less snow in our mountains during the winter and there will be less snowpack on April 1, leaving less snow melt to provide water during the summer and autumn before the rains return. So what do we do with water in late summer, as snowmelt lessens? Since our annual precipitation will increase, the water will be there, so we may need additional reservoir capacity in some locations. Fortunately, the critical Columbia River drainage may be in relatively good shape because it drains off the very high Rockies, where there will still be a lot of snow, and because of the huge storage capacity behind all the hydroelectric dams. Thus lack of snow will have another negative impact: snow absorbs water during heavy rain events, so less snow means less buffering of the rain, contributing to flooding, particularly during the fall. 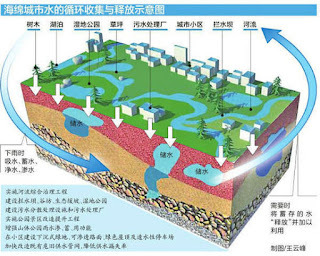 Seriously, I would not want to live in the flood plains of our local major rivers. What about windstorms caused by big midlatitude cyclones? The media keeps on talking about how they will get worse around here. 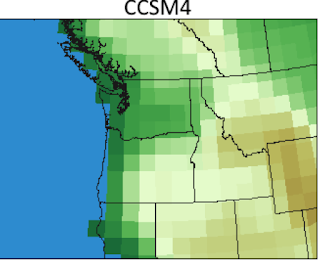 Fortunately, the best climate simulations do NOT suggest this...our storms will be relatively unchanged (see graphic below that was produced for Seattle City Light). 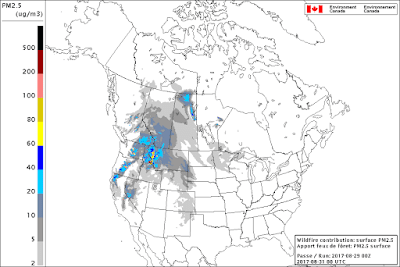 The lack of change of windstorms makes sense. Our wind storms are driven by north-south temperatures differences and those will weaken at low levels under global warming (polar regions preferentially warm compared to the tropics in the lower atmosphere). 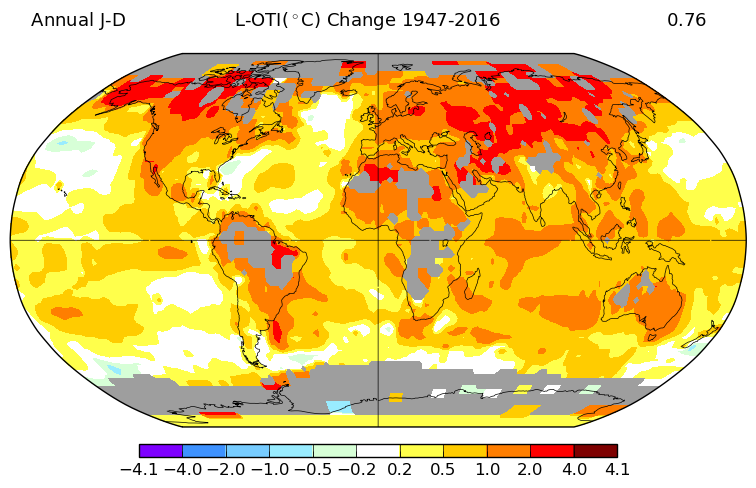 And our computer models indicate all kinds of unexpected changes in our region with global warming. 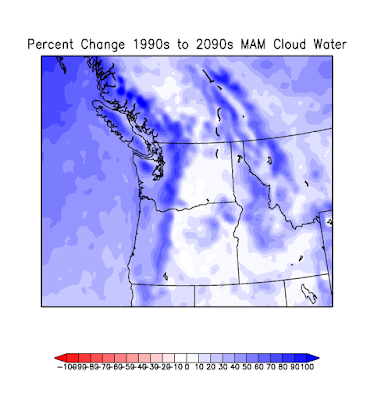 For example, the amount of low clouds in the late spring and early summer may increase, as the greater heating inland causes preferential pressure falls that draw in cool, cloudy marine air (see graphic). Super June gloom powered by global warming. That will send come Californians back to where they came from! 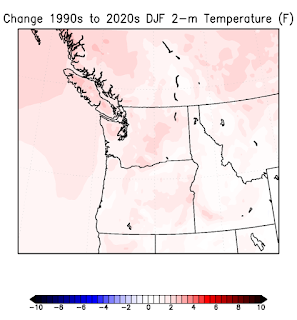 And in a warming world, the strength of summer disturbances and easterly offshore flow may weaken, taking the edge of western Washington heat waves. And, dare I say something that will get me in terrible trouble with certain folks? As described in the peer-reviewed literature, warming will have some positive impacts as well, including a more pleasant climate for much of the year, less black ice on the roads, less exposure deaths of homeless folks, improved air quality during the winter, among others. Enough. I wanted all of you to be exposed to a description of the current science not provided by some local media outlets, a few of which are providing a highly skewed, inaccurate view of what is expected. Some of outlets (e.g., Seatttlle's The Stranger) have descending into exaggeration, advocacy, and name calling, as have a few "advocate scientists.". Society can only make good decisions only if it is given the best estimates our science can provide, and hype/exaggeration/and worse is destructive on many levels. Imagine planning a new reservoir based on exaggerated predictions! Exaggeration and hype also lead to politicization of dealing with climate change, which ensure progress is restrained. Finally, let me note that understanding the local implications of climate change is an act in progress. As I will describe in a future blog, several of us are trying to get better answers by running an ensemble of many high-resolution local climate simulations to get at the uncertainties and possibilities. Other atmospheric scientists (some in my department at the UW) are working on improving the global models. 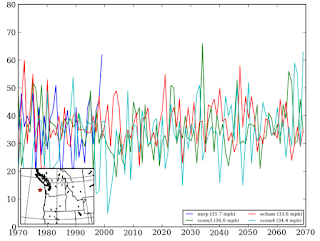 Others, such at the UW Climate Impacts Groups, are trying to translate the model predictions into societal implications. There is much work to be done: in understanding the local implications of climate change, taking steps to prepare our region for what will occur, and to do what we can to lessen emissions of carbon around the world. The importance of having weather radars along our coasts is highlighted by the amazing imagery from the NWS radars at Brownsville and Corpus Cristi. Here is one at 6:44 AM PDT this morning. The circular eye of Hurricane Harvey is obvious. Look closely and you will see evidence of a double eye. This often occurs as a hurricane goes through a eyewall replacement cycle, in which an exterior eyewall develops and then shrinks in radius and intensifies. Storm often strengthen as the outer eye wall tightens inward around the low center. With coastal radars, hurricanes (and other storms) can be examined comprehensively as they approach land. They are in fact, the CAT scans or MRIs of the meteorological profession. 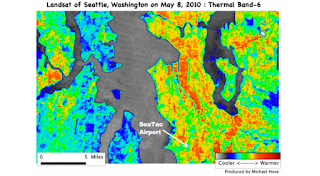 The importance of such coastal radars is why many of us pushed for a radar on the Washington coast at Langley Hill and why folks in Oregon are pushing for a radar on the Oregon coast---the last great gap in U.S. coastal radar coverage. 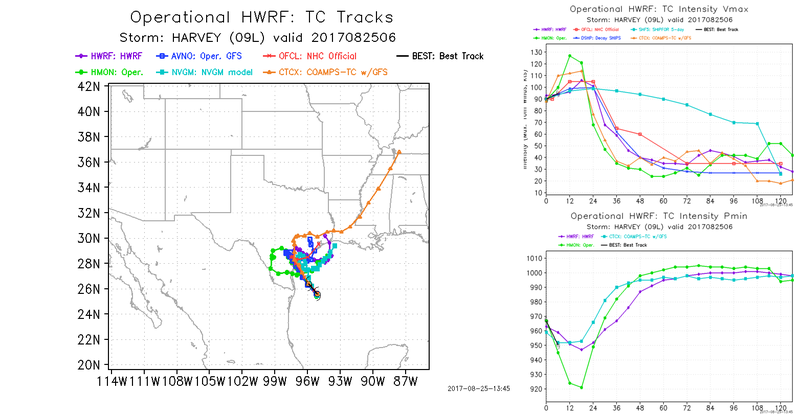 The central pressure of Hurricane Harvey is about 950 hPa. The Columbus Day Storm of 1962 was similar: 955 hPa. Our ability to follow hurricanes is not limited to weather radar. Improving satellite imagery, such as from GOES-16, provides amazing views from space (see below). 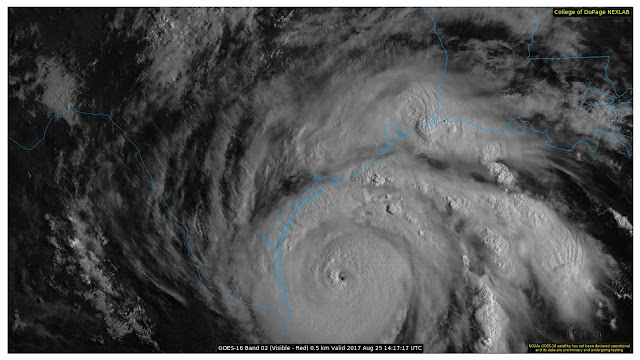 You can even see a very small hurricane eye. 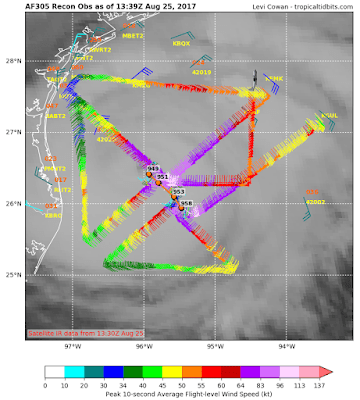 And during the last few days Air Force and NOAA aircraft have been traveling in the storm, taking flight level observations and dropping instrumented packages called dropsondes. 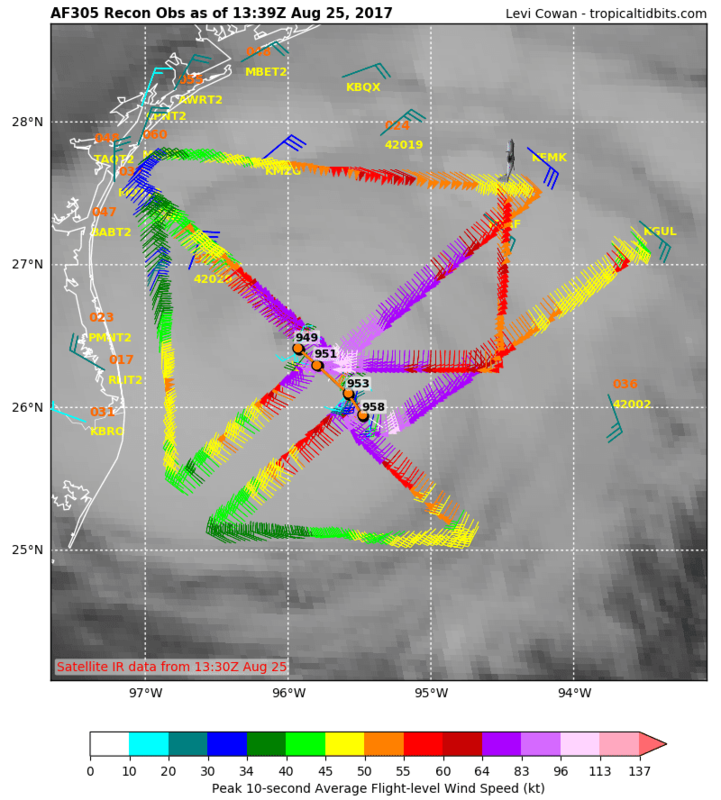 Here is a graphic that show the winds at flight level from an aircraft now in the storm. We can no longer be surprised by approaching coastal storms or hurricanes with all these assets. But our models are still inadequate for predicting variations in intensity and there is some research suggesting that intensity prediction more than a day out may not be possible....we will see. 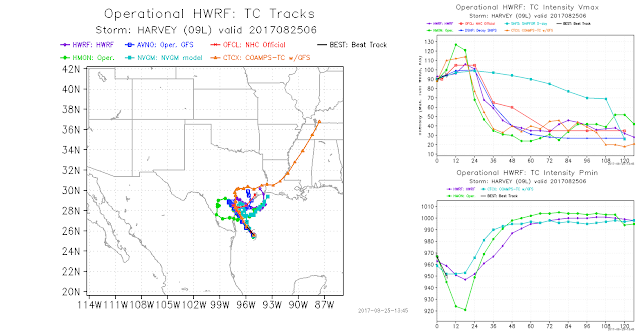 Current model runs are unanimous that Harvey will strike the south/central Texas coast later today and that there will be a huge amount of rain. They disagree about intensity and subsequent path (see below). But nearly all suggest at least a CAT 2-3 storm, with max winds exceeding 110 mph.